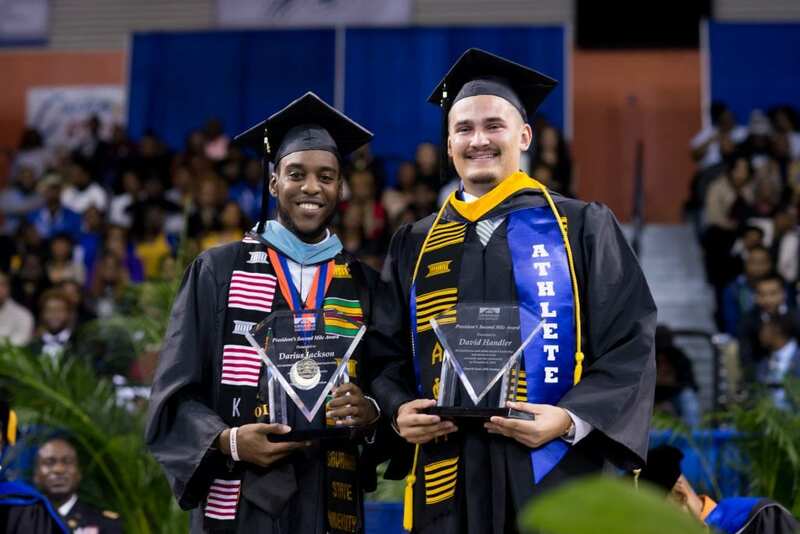 Darius Jackson, from Dublin, Georgia, and David Handler, from Los Angeles, Calif., each received the President’s Second Mile Award at the 193rd commencement ceremony for Savannah State University (SSU) on December 8, 2018. The award, which recognizes remarkable leadership on campus, in the Savannah community and beyond, is open to graduating seniors. Jackson, a biology education major, served as a volunteer at the Frank Callen Boys and Girls Club, West Broad YMCA, and Moses Jackson Community Center. He also joined a spring break alternative trip to assist with Katrina clean up in New Orleans. On campus, he served in leadership roles as a member of the Student Government Association (SGA), Collegiate 100, NAACP and more. Jackson also organized the purchase of ACT / SAT prep books for high school males, and then tutored them. Jackson already has a position lined up as a science teacher at Oglethorpe Charter School, where he spent many hours as a student teacher and volunteer. Handler, a homeland security and emergency management major, also volunteered with numerous off-campus organizations, including after school programs and summer camps. He was a guest speaker for the Savannah Jewish Film Festival, fed the homeless in Forsyth Park and joined an effort to beautify the grounds at the Georgia Regional Medical Hospital. He was the quarterback for the SSU Tigers football team and served on the athletic advisory committee. Handler is focused on youth involvement and community relations and outreach.